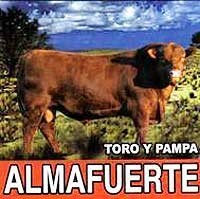 The band Almafuerte was founded back in 1995 by Ricardo Iorio (ex-V8) after Hermética broke up. He was joined by Claudio Marcielo on guitars and drummer Claudio Cardaci ( ex-A.N.I.M.A.L.) , but drummers changed through the years. through the years they released several studio albums - this is no. 7 - and 3 live albums as well as a best-of compilation. In their homeland they are very popular and they are the founders of Metal Pesado - a sub genre of heavy metal. Mastermind Ricardo Iorio and his mates open up with Debes saberlo which is a heavy rocker in the vein of traditional heavy metal. The songs are guitar-driven and the Spanish vocals are their trademark. Ricardo Iorio has a deep, husky voice. With De la escuelita they speed up a bit, but still the songs are mainly mid-tempo to up-tempo. This one has a short, but well done guitar solo. A catchy tune with some surprises. Next is Unas estrofas mas which is a heavy, balladesque song with a melancholy touch. That they can play fast and add some neo-classical guitar solo they show at La máquina de picar came. Does anybody remember the Spanish band Baron Rojo? Well, Almafuerte sound a bit like them - not because both sing in Spanish -, it's more their sound in general. Baron Rojo been compared with Motörhead in their high time - and with Donde está mi corazón the Argentines show this a bit too, only for a moment. The guitar adds some boogie vibe to this one. The title track starts off with some acoustic guitar and is more a melodic hard rock tune. Here the guitar sings and Ricardo Iorio shows a different shade of his husky voice. I think this album is interesting mainly for heavy metal fans who like their music with different tongues. But perhaps the compilation or their last live album is a better choice to check out Almafuerte, but as the CDs won't be available everywhere, see what you can grab. If you want to give it a try, listen to Pensando en llegar, La máquina de picar came, Unas estrofas mas and Toro y pampa.